Dr. Conroy studied advanced law, philosophy, and psychology before becoming a psychoanalyst. She received a doctoral degree from Union Institute. Her doctoral study specialized in psychoanalysis, migration, culture and identity. She is also a graduate and faculty member, supervisor at Object Relations Institute for Psychoanalysis. 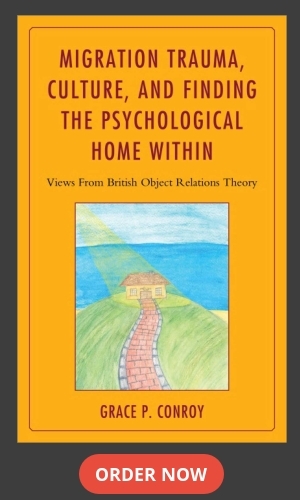 She has been teaching courses in psychopathology, personality development, object relations theory techniques and practice at Object Relations Institute for Psychoanalysis. She has conducted workshops where she introduced the notion of “Finding the Psychic Home Within” and presented clinical cases and poetry illustrating the journey from often emotional exile to finding a degree of the psychic home within, and a sense of belonging. She participated in different panel discussions and presented her psychoanalytic work at a national American Psychoanalytic Association meeting as well as at the NPAP Psychoanalytic Institute. She gives talks to graduate level programs at universities, psychoanalytic institutes, and other cultural and international organizations on the topic of immigration, cross-cultural studies and personality disorders. Her special interest in “migration phenomenon and culture” comes from her own experiences of different cultures. She has considerable familiarity with European and Asian cultures. Due to her own migration experiences she has a particular emotional awareness of the different cultural selves of migrant clients functioning in foreign cultures and “migration trauma”. In her books she explores the magnitude of the human migration phenomenon in our globalized world, and its consequences that affect all humanity.